You may find many recipes on the web, and many of them are similar to the one below. 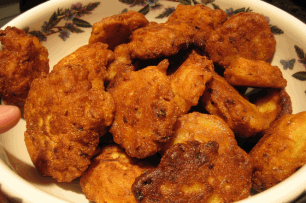 But as many people who contact us ask "What is the true conch fritters key west recipe?" we have focused in on what the cooks and chefs in the southernmost part of America would consider as the real McCoy. But please note, although we have tried our best to remain as authentic as we can, we have given information for substitutes for hard to obtain conch, such as calamari for example. You maybe asking if this is a recipe for Conch based fritters, then why do we start with telling you what you can replace them with? Quite simply these sea snails are very difficult to locate to say the least, so check our information further down the page which will help you in your search of the conch. Of course if you decide that you cant wait and want a plate as soon as possible then most restaurants in the Keys like Alabama Jacks for example will serve up conch fritters. Why are planning to cook some real Florida Keys masterpeices then what better than a little bit more information as to the "Where, How And Why" of using the conch to cook with. For example, How you can get one, where you can get one....I think you get the idea. So read through for more detailed information, and expert videos to the animal that you are looking for, and then you will be an expert and ready to go too. Another great place in the Florida Keys that are famous for their conch fritters are the Islamorada Fish Company, who have been around for 30 plus years, selling the freshest fish in Islamorada. Take a look at the following video, which shows how this great establishment create their fritters that bring people back to fill their plates up again and again. And then at the bottom, following along with our own conch fritters recipe, you print up our step by step guide and have it by the side of you whilst you increase your Florida Keys cooking skills. One pound of meat (of course this should be conch meat) and then dice into small pieces. Take the flour and cornstarch and sift them together. Spend time on this so it's as fine as possible. Then in a large mixing bowl, take the flour and cornstarch and mix them together with the egg whites, eggs, and the milk. Once again make sure that they are all thoroughly mixed together for the perfect conch fritters coating. Season with the salt and white pepper. Take your deep pot, which should already contain your peanut oil, and start heating it up to about 350 degrees f.
Now start scooping the batter (One Ounce) into the oil and keep on frying the mixture until it turns a rich golden brown colour. You should be left with some gorgeously golden fritters, which then need to have the excess oil drained from then. The best way to do this is to place them on a paper towel and then press down lightly on the surface of the conch fritters. Once you have done this, you are left at the part of the recipe when you can get creative and experiment with many different sauces until you get the one that says "STOP, I have died and gone to heaven"
This recipe was provided by professional chefs and has been scaled down from a bulk recipe provided by a restaurant. Of course if you are a native of the Florida Keys then you can go searching for your own free conch, by scanning the sandy bottoms around the coast of the Florida Keys. Most of the sand has grass growing out of it, which is a particular favourite hiding place of the conch. Their shells are quite often in these kind of places, but can still be difficult to locate due to the pale shells, which blend in well against the sand. One thing for sure is you can't just dig a knife into the conch shell....well you could but I'm sure you will utter some choice swear words as you break the blade of your knife. These conch's hold themselves in place inside the shells by creating a really strong vacuum, which anchors them away from predators and the like that want to eat their succulent and fleshy meat. Unlike most predators however you are skilled and full of cunning (and as long as you can read) will know how to free them from their rock hard hiding place. 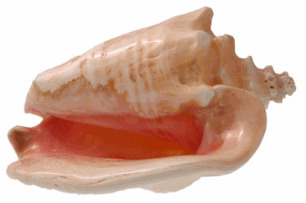 The trick to getting the Conch out of their shells, is breaking the vacuum by making a hole in the shell on the top on an inside spiral. 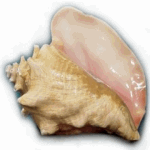 To make a small hole in the shell, what the fisherman throughout the ages have done is to get another conch shell and use the tip of that. But don't worry if you haven't got another then a small axe will do, or you can even use a hammer to knock a small hole in the shell and release the pressure. Once you have made a hole and broken the suction you can just pull the snail out with the tip of your knife. It won't offer much resistance anymore. If you are having trouble actually seeing the snail, and I can tell you sometimes they go deep into the shell, then you can easily (well...perhaps easily is the wrong word) break the very outermost part of the shells spiral and then have a look. You should be able to see the snail, get hold of the little blighter and yank him out. Now you've done the hard part and managed to free the snail from the protection of its shell, you should be able to see a few things. Firstly the snails eyes, then a darker part of skin which actually has an incredibly powerful foot attached, lastly an inedible and tough nail used for snail like protection methods. You won't want any of these in your Conch fritters. So lets get rid of them. Then peel off the dark colored skin so you only have the succulent white parts. You are now ready to follow the recipe as shown above. If you are struggling to get the Conch out of the shell, then you can throw the whole thing in a pot and boil it in the shell. This could be easier, as other than the nail, everything that we suggested you should thrown away can be kept and eaten. Lastly, if you still can't get the snail out of its shell, now it is dead and cooked just smash the shell and get it out.